Update: Thanks to all those who participated in or started their own #flashreads groups in Delhi, Bangalore, Bombay, Kochi and Kolkata–what we had this year was several small groups of volunteers doing readings in libraries, markets and public parks. Special thanks to our youngest protestor in Delhi, 10-year-old Nikhil, who read from Luka and the Fire of Life. 1) make it a larger protest. This wasn’t my intention when starting #flashreads, which was meant to be a small and personal way of protesting, but it would be really nice if someone did want to organise it in a bigger way, and if they could raise issues around free speech and censorship in college campuses next year. 2) include more readings from more Indian languages–absolutely, and many thanks to those of you who read from Faiz, Paash, Muktibodh, Gadar and VM Basheer this year. 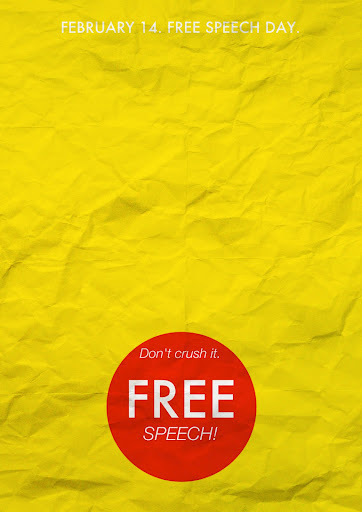 3) have a Free Speech week, instead of a single day, starting on February 11 (World Free Expression Day) so that this could go beyond just the issue of banned books and censorship. Just keeping these up here as a reminder–and once again, thanks for your time and your ideas. #flashreads is a simple way of registering your protest against the rising intolerance that has spread across India in the last few decades. At any time on February 14th—we suggest 3 pm, but pick a time of your convenience—go out with a friend or a group of friends and do a quick reading. If you’d like some suggestions/ selected passages, here’s a link to some short passages. If you want more and longer selections, email me or leave a message on twitter.com/nilanjanaroy, and we’ll send you a selection. 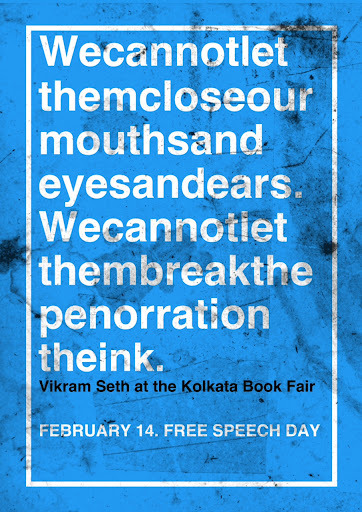 Or pick your favourite passage on free speech, or passages from a challenged book or the works of any writer who has faced sedition charges, a book ban or other forms of censorship. One way to do an effective #flashreads is to work like a traditional #flashmob: with a group of three-ten friends, select what you’re going to read in advance, and do the reading without announcement in a place like a Metro station, the area outside Dilli Haat, the open spaces in malls, each person picking up from the previous reader. Have fun. If you have a blog, a tumblr or a website, an easy way to join in is to post Tagore’s poem, “Where the mind is without fear” (see below) on your site for a day, or choose any other passage on free speech/ censorship that appeals to you. Or write a post about free expression and what it’s meant to you in your own life. Wonderful idea, great going ma'am! I am game. a suggestion that doesn't involve Rushdie would be great as this has been politicized in our country right now. Its not exactly about freedom of expression but something that perhaps helps in keeping the Freedom alive – Individualism and its often frictional encounters with societal norms. http://arjumand-baatcheet.blogspot.in/2012/02/society-and-individualism.htmlThis one's by Christopher Hitchins.It was in the January edition of Reader's Digest.Its about the Freedom of Speech.http://www.rd.com/best-of-america/christopher-hitchens-on-freedom-of-speech/Hope both of them are useful. Brilliant idea! Shared this on by blog. We walked through a mall with gags on and placards that read "don't let a bunch of bullies gag you". We got stopped by a security person who got violent and set a bunch of guards after us in spite of the fact that we hadn't said a word. When we asked him what we were doing wrong, his only response was, "this is a mall". By this time we had walked around the mall and through a food court and coffee shop. Lots of people read the banner, but the only guy who came to ask us what it was about wasn't Indian. Makes you wonder. – S.